Preheat the oven to 180°C. Use a heavy-based casserole oven dish (or large frying pan) and dry roast the coriander, cinnamon, cloves and star anise for a few minutes. Remove the roasted spices and keep on the side. Add butter and olive oil into the same casserole and heat until warm. Use a clean cloth and dry the birds. Place them in the casserole to brown. Turn the birds gently to brown on all sides. Add the garlic and onions and brown on the outside while turning. 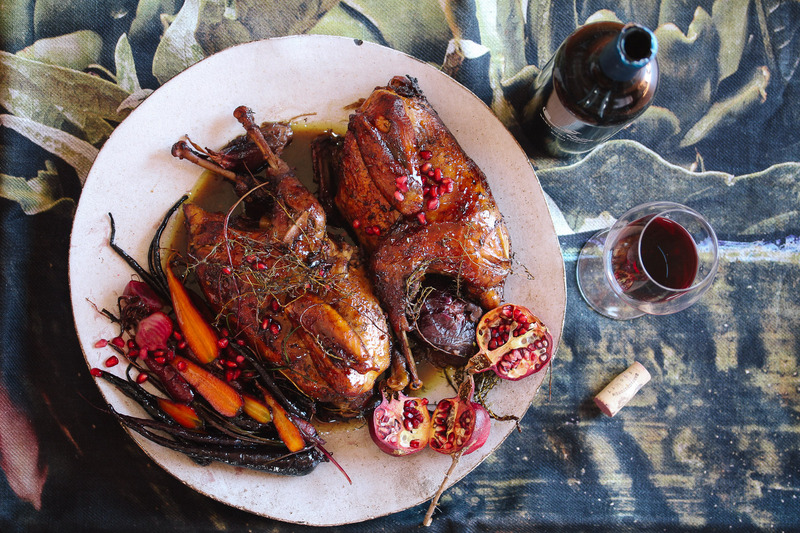 Sprinkle the golden-brown birds with the roasted spices and pour the red wine over. Add the giblets, if you like, into the bottom of the dish. This will give additional flavour to your sauce. Add ginger into liquid and drizzle the birds with the honey. Season to taste with salt and freshly ground black pepper. Top with the sprigs of thyme and secure tightly with the lid. Place into the oven and cook for 1 hour 30 minutes. Add peeled potatoes (if using) and cook for another 30 minutes or until soft. If not, continue to cook the birds only until soft but not falling from the bone. Do not turn the birds during the cooking process – this will ensure an attractive colour. Place on a serving platter and garnish with pomegranate rubies. Serve with sweet honey-roasted baby carrots. You can also enjoy a taste of this warming tipple at home; it’s available from our online shop.